By rights, as the month is new, this spot on our homepage should be occupied by the cover image of the latest Quadrant, the May edition which has just now gone on sale. Stripped last year without warning or explanation of all Australia Council support, we need those sales and subscriptions as much as Australia needs a magazine that is literate, analytic, eclectic in its interests and unafraid to offend those for whom taking offence has become their often lucrative stock in trade. So, please, before reading on, click here and subscribe. OK, bought your subscription? Good. Now look at Liberty Victoria’s announcement reproduced atop this post and do your best not to throw up. 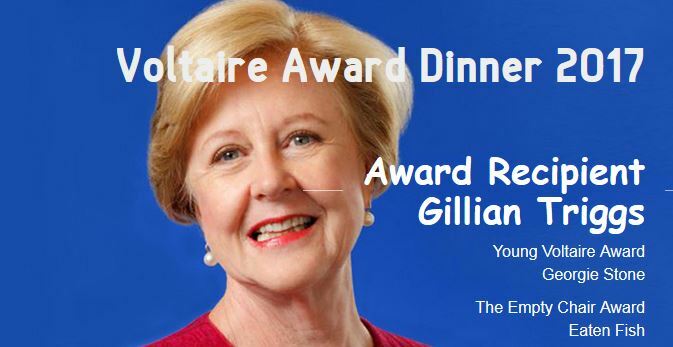 Gillian Triggs, the woman whose Human Rights Commission persecuted Bill Leak, is to receive something called the Voltaire Award. This is the creature whose noxious offsider, Labor hack and grievance pimp Tim Soutphommasane, trawled for complaints online, found a white Aborigine in Germany who was prepared to lodge a complaint (subsequently withdrawn), and then harassed a thoroughly decent man through the last 12 months of his life. And now his boss is honoured for defending free speech! What’s next, Ivan Milat to be garlanded for his hospitality to hitchhikers? Ms Triggs will be told how wonderful she is at a gala dinner in July, the details of which are here. Would anyone else care to join me outside Melbourne’s Sofitel Hotel on the evening of July 21 to let her know the depth of contempt in which she is held by genuine supporters of liberty and free speech? If you need a reminder of this woman’s handsomely remunerated wretchedness, follow the link below, which leads to an index page of links to Quadrant Online essays published in the weeks after Bill’s death.